0.08-0.12mm,which is soft,comfortable,and good odor-resisting and with low friction nosie. 2.Intestinal gas and odor can be eliminated by the inner active carbon filter. 3.With multi-layers sealed technology,effectively avoid the risk of leakage. 4.The hydrocolloid adhesive is mild,and non-irritating,safe for long time wearing 5-7days. 5.Good resist for PH value between 4-10 and absorbency 3.47g/g/24h. 6.There are sticking and buckle style for the opening end of ostomy bag open.Many options for patients. 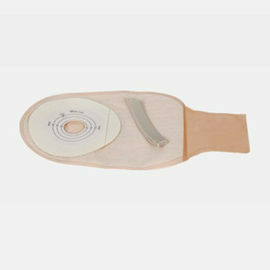 7.Different types of ostomy bag can meet different needs of stoma patients. 2.Hydrocolloid underpan is highly adherent,hypoallergenic,comfortable and friendly to the skin. 3.The whole product is soft,comfortable,and in miniature size. 4.It is easy to operate with. 5.It is for patients with solid faces and regular excrection.